A New Luxurious and stylish addition in any home. Made in Italy from High Quality Material. 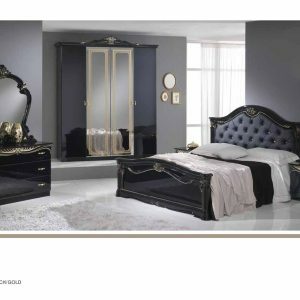 The Eva-Ben is a Contemporary & Elegant Italian bedroom set with a modern Twist Finished PU padded Headboard in High Glossy Black/Gold and Beige/Gold Complemented with design and yet the beauty of all times and a wonderful statement to any bedroom. This is a stunning Italian bedroom suite beautifully finished in high gloss with detailed antique finish for a deeper richer look with a modern twist, Carefully hand crafted to high quality finish with raised capitation design on Padded head & foot board. This is one of our best selling bedroom. your specific interior color scheme. We are a family-run company with over three decades of experience behind us. Along the journey we have helped thousands of happy customers make the right choice when buying furniture for their home. 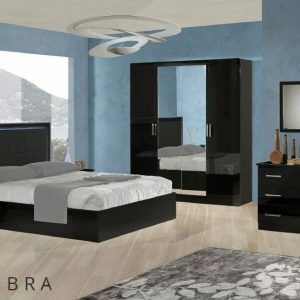 We Based in London we supplies and delivers our products to customers across the UK and Scotland and we deliver our bedrooms in our own company truck so we will promise to deliver the items in 100% perfect condition.we provide professional assembly service to make easy purchase for our customers .We are confident that you will enjoy your furniture shopping experience with us and look forward to helping you in any way. RETURN POLICY : ON DELIVERY OF THE STOCK PLEASE CHECK EVERYTHING PROPERLY BEFORE YOU SIGN DELIVERY NOTE. AFTER DELIVERY IN CASE SOMEONE DOES NOT LIKE COLOR OR CHANGE MIND WE CAN NOT OFFER REFUND. WE DO NOT OFFER REFUND OR EXCHANGE IF THE ITEM IS ASSEMBLED OR OPENED. WE OFFER FULL REFUND IF ITEM IS UNOPENED. THANKS FOR YOUR BUSINESS WITH US.